Dreamtime - Lauri Turjansalo's musical journey started in the late 90s. After years of experimenting music in a limited tracker environment it was time to move onto more dynamic sound - Dreamtime project was launched in 2003. The project focuses solely in spacesynth music with an idea of emphasizing dreamy textures while keeping catchy melodic drive of spacesynth running strong. The first track released under this pseudonym was called "Purple Twilight" which received a lot of positive feedback. Later the music got shaped and developed step by step. In 2005 "Before the Dawn" won the music contest of Spacesynth.de website and was later released on CD by Audioenergy. New tracks have been regularly released as free downloads as well as on compilation cd's. Dreamtime music is put together in digital environment and aided by analog sound sources. Love for 80s polysynth sounds is audible in most of the tracks but he keeps himself constantly open for new ideas. The music is influenced by classic acts but also new wave space artists as well as other electronic music genres. Dreamtime's stylistic background lies in demoscene music rather than italo. There has been a couple of times when he has gone briefly back to that crunchy sounding world of 8bit goodness and released the results. Themes and inspirations for new compositions come from outer space and inner space, past and the future, and anything with strong visual aspect from films to art. Outside of Dreamtime discodelia Lauri writes music in other electronic styles and does sound for video and multimedia productions. Lauri is also much involved with the Spacesynth.net website. Its goal is to be your go-to space bar, a place where artists and fans can meet, discuss, share music and ideas. The admin team has been running the website since 2005 and it has become a home for many space maniacs across the globe. 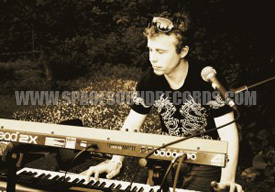 In 2007 Lauri was contacted by Space Sound Records asking to make a remix for the Space Project cd. Label's enthusiastic ideas of taking the genre further convinced him. Future collaboration was soon decided. Hello and welcome to Spacesound Records. We would like to shed some light on the individuals who make the music we all love. What better way than hearing it from the artists themselves. Lauri (or should I say Alf-meister), Welcome to Spacesound! Thanks. It was a long flight from my home planet. Apart from my alien duties I'm just an ordinary guy living in Joensuu, which is in eastern part of Finland. Currently I'm a media student who also does some audiovisual work for commercials. I have lived all my life in Finland and spent most time studying. I'm a true 80s child as I was born in 1980. Got exposed to a lot of that culture back then and now my friends must think that I have gone crazy because I make this type of music, haha. It's pretty strange actually. Somewhere in my teens when I had this heavy metal phase going on I suddenly got very interested in making my own music. I couldn't play any instrument so I started to fiddle with software. The music was plain horrible but I really enjoyed the process and I was very productive for a couple of years. I don't have any educational background besides my grandfather trying to teach me to play piano. But I never liked it back then and didn't learn a thing, hehe. It would be a different story now. I have mostly learnt on my own. I like to eat cats... err, I mean, music is the most important one. Also, I watch a lot of movies, photography, capoeira, resetting my mind etc. Yeah, different kinds of electronic music like ambient, retro-em and other weirdness. With spacesynth I tend to think a lot about producing and melodies but the looser stuff makes me focus more on the feel and images they bring. These other types of music are more for myself. Pretty late, that would be in 2000 or so. I came in contact with the genre from 8bit side of things. Just a coincidence but I was immediately hooked. Later I became rather active on Internet and blabbed endlessly about Juno basslines. Catchiness and space drive. The music is so pure and people who make it do it for sheer love. Generally I think there's too much recycling of clichés. I would like new artists to be more brave and bring their own identity to the music to stand out of the crowd. Sure, I have done it too but I wouldn't get anywhere in the long run by doing it over and over again. I always find myself coming back to Gustaf Grefberg and admire him for that special doskpop feel he has developed. Often in my music atmospheric passages are inspired by German legend Tangerine Dream. Not anyone particular. I like most what Michiel and Rob have done and have much respect for them. Macrocosm 'Second Voyage' for its catchiness and melody work, Protonic Storm 'Inner Travelling' for the immense soundscapes, Koto 'Masterpieces' for summarizing the classic era and Xain 'Born in the Stars' for pure coolness. Sure. There are some artists I would like to work with. Certainly most us would like to work with Michiel. To some extent. I like the powerful and bold style such as Radiorama. Those light-hearted and sweet italo disco songs are too cheesy even for me. I sometimes watch italo videos on Youtube for entertainment. My time came after the golden times of the demoscene had faded away. I was in contact with a couple of groups but I never considered myself to be really part of it. But still, I think that's where my roots are because I spent a lot of time listening to that music - and only afterwards I found space and italo. Generally people with the demoscene background have a little bit different approach to spacesynth. The music is often more complicated and doesn't necessarily follow any pop structures. Melodies are also longer than those used in italo disco. Basslines are sometimes different with more swing to them. I believe there are countless demoscene people out there who would be thrilled about spacesynth if they just found out about it. Sometimes I start with chords, sometimes melody. Sometimes I make drums first. So I don't have any definite way of starting a track. Sometimes when I work on a non-spacesynth track I accidentally come up with a melody that fits spacesynth which then triggers inspiration. I can only speak from my own experience. Melodies are the ones that brought me to this music so I feel that the emphasis should be on harmonies and composition. Taking the emphasis somewhere else makes this music completely different. That said, I most definitely don't think this music should be just melodies playing. Drums in spacesynth are generally really simple and spicing those up could really bring up something new and make things more energetic. Chris has also proved several times that those long build-ups can work very well. Somewhere between, leaning towards classic style and reaching for more contemporary sound. My melodies are rather oldskool and probably will always be. I don't believe in reviving the old days as they were. What is great about LD and Koto is melodies. Some tracks are works of a genius and have fantastic feel to them but I think new artists have showed that other aspects like structures, percussions and atmospheric side of things can be done more effectively. I have been monitoring this genre closely since 2000 when the new wave artists were stepping in. During this time we have got a lot of new artists but meanwhile many older ones have unfortunately quit the scene. I don't think the music quality has improved as much as it could have during the last years. I think the genre needs more artists with a vision and sense of writing music really. However, currently there are some new and interesting projects going on and it will be interesting to see what happens. I use software for recording, sampling and some synth work. I have several Rolands including the MKS70 and JD800 and modern digitals like the Nord Lead 2x. One item I'm pretty proud of is the Roland SVC-350 vintage vocoder. I like to do most of my FX work digitally but I have the Small Stone Phaser and Big Muff analog stompboxes for the special character they bring. If I want to be really productive I usually skip the hardware. I have seen many of these debates and I always wonder why people bother. Since the beginning I have tried to take the best from both words and not limit myself. With software it's very quick to work and for samples it's perfect. Personally what I find with hardware most appealing is the hands-on approach. Synths with good interface are simply inspirational to use. It's not even that much about the sound in the end - even though some of them do sound amazing. I'm glad you asked. But I'm not telling you the answer. It's hidden in these answers. It has three letters. Oh wait, who am I kidding? Spread the message, look into the future and stay open-minded. Big thanks to everyone visiting Spacesynth.net and contributing. That inspires us to keep on working. 4. TV or Sport? Since I threw my TV away I have to answer sport. 8. Cat or Dog? Cat. They are delicious. 9. Beer, wine or Spirits? Depends..
No problem! Was a lot of fun.